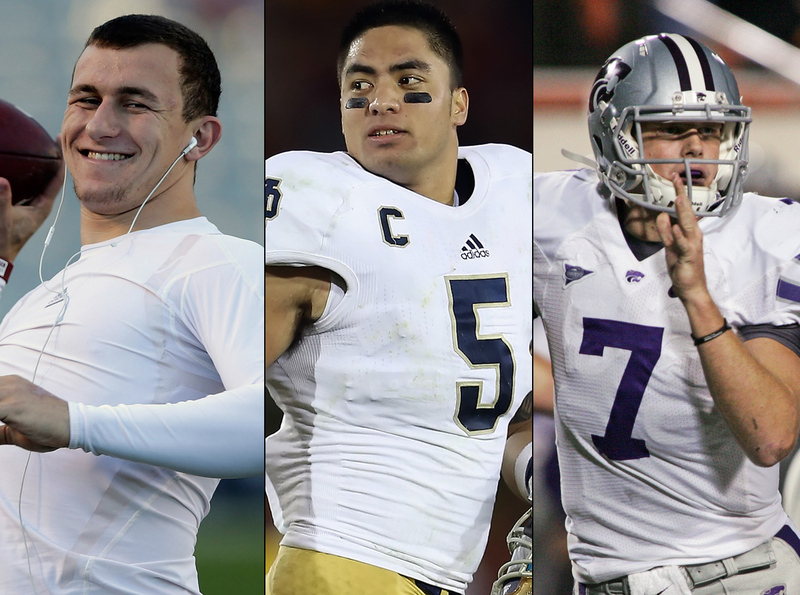 NEW YORK Texas A&M quarterback Johnny Manziel, Notre Dame linebacker Manti Te'o and Kansas State quarterback Collin Klein are the finalists for the Heisman Trophy. The three players invited to attend the presentation ceremony in New York were announced Monday on ESPN. Manziel is the favorite to win college football's most famous player of the year award on Saturday night in Manhattan. He would be the first freshman to win the Heisman and the first Texas A&M player since halfback John David Crow won the school's only Heisman in 1957. The closest a freshman has come to winning the Heisman was Adrian Peterson of Oklahoma in 2004, when he finished second to Southern California quarterback Matt Leinart. Peterson was a true freshman. Manziel is a redshirt freshman, meaning he attended school last year and practiced with the team but did not play in a game. Michael Vick of Virginia Tech came in third in 1999 as a redshirt freshman and Herschel Walker was a true freshman for Georgia in 1980 when he finished third in the Heisman balloting. Nicknamed Johnny Football, Manziel quickly became a national sensation this season, putting up huge numbers in first-year Texas A&M coach Kevin Sumlin's spread offense. He led the 10th-ranked Aggies to a 10-2 record in their first season in the Southeastern Conference. With a knack for improvisation, Manziel racked up an SEC-record 4,600 yards of total offense, including 1,181 rushing to lead the conference. The 6-foot-1, 200-pound Manziel zoomed to the front of the Heisman race on Nov. 10, when he passed for 253 yards and two touchdowns and ran for 92 yards as the Aggies upset then-No. 1 Alabama 29-24 in Tuscaloosa. Manziel and Texas A&M will play Oklahoma in the Cotton Bowl. Te'o is trying to become the first defense-only player to win the Heisman. The Fighting Irish have seven Heisman winners, tied for the most with Ohio State and Southern California, but none since Tim Brown in 1987. He became the face of the No. 1 team in the country and leader of a defense that has been the toughest to score upon in the nation. The senior intercepted seven passes, second-most in the country and tops for a linebacker. He also led the Fighting Irish with 103 tackles, and earlier Monday won the Butkus Award as country's best linebacker. Te'o and the Irish face No. 2 Alabama in the BCS championship game on Jan. 7 in Miami. Klein would be the first player from Kansas State to win the Heisman. He seemed to be the front-runner for several weeks until Manziel's late push. When Klein threw three interceptions in the Wildcats' late-season loss to Baylor, Manziel moved to the front of the race. Klein is a multitalented quarterback like Manziel, but with a different approach. The 6-5, 226-pound senior is a bullish runner who scored 22 touchdowns and threw for 15 more, while leading the seventh-ranked Wildcats (11-1) to the Big 12 title. Earlier in the day, Klein won the Johnny Unitas Award given to the top senior quarterback in the nation. Kansas State plays Oregon in the Fiesta Bowl.